Bettie Gordon Byrd, 93, of California, MD passed away on October 29, 2018 in La Plata, MD surrounded by her family. Bettie was born on January 30, 1925 in Martinsville, VA to the late Carle Eugene Gordon and Ila Ruth Dalton Gordon. Bettie married her loving husband, James Silas Byrd in Martinsville, VA in. Together they spent 37 years before his passing on April 28, 1982. Bettie was a resident of St. Mary’s County for the last 60 years. She was a member of Callaway Baptist Church where she was very active. 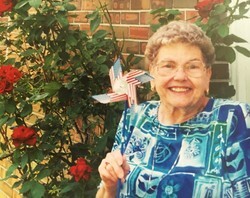 She loved life and spent much of her time helping others by volunteering her time at hospice, caring for others that were sick, and taking people wherever they needed to go. She loved food and eating out at her favorite restaurant was…… She also enjoyed cooking making many delicious meals but her specialty was baking lemon cookies. Bettie is survived by her children, Robert Steven Byrd (Terri), of Midlothian, VA, Kevin James Byrd (Darby), of La Plata, MD; eight grandchildren; six great grandchildren; and one great-great grandchild. In addition to her husband and parents, she was preceded in death by her son, Gary Lee Byrd; and her sister, Margaret Crumb. Family will receive friends on Monday, November 5, 2018 from 5:00 to 7:00 p.m. with prayers recited at 6:00 p.m. at Brinsfield Funeral Home, 22955 Hollywood Road, Leonardtown, MD 20650. Interment is private. Arrangements by the Brinsfield Funeral Home, PA. This entry was posted on November 8, 2018 at 4:40 am and is filed under All News, Obituaries, z Obituary Ad Top. You can follow any responses to this entry through the RSS 2.0 feed.